Jungle Red Writers: Beaucoup de Packing Tips! 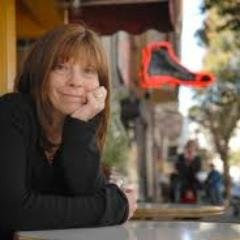 Merci, Cara Black! Before we start: CLICK HERE for a fabulous offer. Just saying. Then come back. HANK PHILLIPPI RYAN: Bonjour, Rouges de la Jungle! Aujourd hui, notre amie celebre, la fabulouse (made that up I think) Cara Black. Et aussi, quelle excitement, elle est en Le Booktour! Mais, je pense qu’il voudrait tres dificile, um, to pack. Mais, who better to tell us comment de faire cela than la fashioniste extraordinaire? CARA BLACK: Oh la la, packing for a three week book tour in le roller bag! Bonjour Reds, Thanks for inviting me back! Hank asked me to share tips on packing for a book tour. You’d think I’d have it down to a science by now, right? 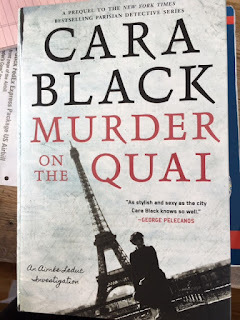 Murder on the Quai comes out next week - the 16th Aimée Leduc investigation. Yet packing still feels like alchemy - how in the world will I concoct the mixture and do this? Certainly not with smoke and mirrors. Trial and error has shown me it’s all about stripping down to essentials and fitting everything - and I mean toutes - in one roller bag. One roller bag, three weeks and 27 book events. Sucking in breath here. The added challenge on this three week book tour is not only packing for multi temperatures from rainy Seattle to muggy Houston and Ann Arbor and parts East but ending up at my editor’s July wedding in Massachusetts. A wedding outfit? Mission Impossible? My book tour wardrobe is simple, black on black and nightly washouts. Scarfs for color, an Eileen Fisher knock off swingy wrap. Fabrics - I keep to cotton, silk, linen to make it lightweight and easy to layer up for cold planes. This year presents a new packing challenge, June and July in the midwest, South and East coast. Isn’t that muggy and humid? I’m going for a linen tunic - the little wrinkle linen type, alternating my staple black cotton tunic with leggings and silk shell to layer over for evenings. But what in the world to wear to my editors wedding that will bear up for three weeks on the road? Suggestions Reds? The wedding outfit stymies me. Now to footwear - whatever covers my feet presents the biggest space challenge. Right, Hank? How in the world to fit boots apart from wearing them non-stop. At least this time I don’t need them. For 15 years every March I’ve toured when Aimée’s next investigation came out which presented winter packing challenges - below zero in Minnesota, sleet, down coats and soggy footwear. Not to mention March madness and snow closing the airport in Detroit. So this time it’s Skeecher’s super comfy ballet flats for hiking through the airport, low platform espadrilles for events and flip flops for driving. My rule of thumb has been to go with a staple outfit - which becomes my uniform - always black, washable and without buckles and metal straps to hold up the line at TSA. Let’s talk toiletries. Cleanser, astringent goes in little plastic bottles, perfume samples from Nordstrom - you know those tiny capsules that offer an amazing spritz and take no room, makeup (they have great travel sized at Sephora) fits in the Baggie or it STAYS home. Electric toothbrush? Not any more just a toothbrush 6-pack easy to break off and stick in a pocket, use and discard. Three pairs of undies and leggings washed out at night, a paperback to read in case I’m on a runway three hours. An extra charger. Oh and the heaviest thing - bookmarks for 27 events! That’s all due to dear Rhys but that’s another story. The book tour packing isn’t so different from what I pack for Paris - everything must fit in one roller bag - or le rollaire as the man at the shop in Belleville calls it where I get the best price on his newest model. Last month he sold me on the hardshell four wheeler lightweight swivel special that fits into the European sized overhead. I discovered the hard way that our overhead requirements are different from European and had to pay extra on the runway in Easy Jet. Don’t call it cheating, but over my shoulder I sling a hardback-book-sized super light weight nylon rucksack that expands and holds the ipad, chargers, medications, and tiny wallet - my new find from Galleries Lafayette - carrying essential ID. The small rucksack is a shapeshifter - easypeasey - and scrunches into a pocket. Have you ever seen the tips for packing videos? I recommend them. One changed my life - rolling up everything i.e. all your T-shirts into thin little rolls like sausages, even jeans, and presto life fits. I go for the cigarettes in a box approach. Thank you, Reds and appreciate any tips for a lightweight outfit for my editors wedding! HANK PHILLIPPI RYAN: I tried the rolled-up-thing method. I gave up, because I bring jackets, and they..don’t roll. And I swear by tissue paper. And I so agree--if it doesn't fit in le rollaire--I will never think of it another way--it STAYS home. And I ship my bookmarks ahead, and they (usually) meet me at the hotel. So, chere Rouges, any packing tips? And are you heading anywhere this summer? 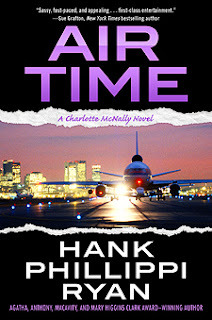 And--speaking of AIR TIME--don't forget to CLICK HERE! (It's re-pub day!) Especially if you're traveling this summer! I'd love to send you some limited edition gifts! It certainly sounds as if you have this whole packing thing down pat, Cara! I, too, am a fan of rolling things to fit them in the suitcase and one bag is all I want to take when I travel. However, no traveling for us this summer. It never would have occurred to me that the overhead compartments would be different in Europe . . . . Adding a wedding outfit to your suitcase really does sound like Mission: Impossible, but I’d be willing to bet you’ll figure something out. A lightweight summer dress or long skirt, silk perhaps? Whatever you decide, I trust your book tour will be a success and the wedding will be a happy celebration. Joan, I love the silk skirt idea! I'm on week three of my European trip, and I've been living out of une rollaire, plus a tote and my incredible Pacsafe cross-body bag. I only needed the tote because of having to bring a computer for Rhys's workshop, but my purse fits inside when boarding planes, soit counts as a personal item. Some things I've learned: first, you do not need any chargers, only a cable, plus a USB outlet plug, This one thing has changed my life, and if my straightening iron could be used with a USB, I'd have brought it. I found a European plug with a USB port. Which brings me to hair care. Forget it. Either have a wash and wear hairstyle or accept the inevitable. My hair is cut for being styled; however, it stubbornly curls and frizzes at the least moisture. I found a frizz-free product in a tiny size, but it's a challenge, especially with hotel hairdryers. And I always just use whatever bath and shampoo products are provided, rather than trying to fit them in. The same company that makes the Toob also makes leak proof tubs in two sizes. I filled the small size with my moisturizer, and I still have a lot left, with five nights to go. These are also great for earrings and necklaces. I ended up buying a long-sleeved lightweight turtleneck in Italy, it was so cold. And a mohair wrap. I'd only taken one long-sleeved shirt that wasn't sheer; it's been hand washed several times. Luckily, I had layers, and scarves. One thing you have to worry about less in the States is having your pocket picked, especially at stations. Wow, they are devious here. Cara, you should ask Hank how she managed her stunning outfit at the Malice banquet. It looked like a ballgown, and was gorgeous. Have a wonderful trip, and best luck with your new book. Cara, your booksigning schedule makes my head spin! the packing aside, how do you keep your sanity with that kind of schedule? Now, tell us about the new book! Love to find light and dressy Roberta & will look! 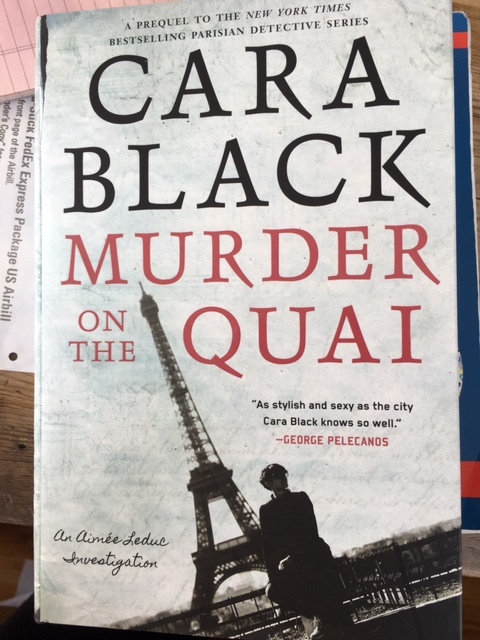 I'm excited about Murder on the Quai - we meet Aimee as a premed student in the Sorbonne and it takes place in Nov 1989 when the Berlin Wall fell and her supposed boyfriend - an aristo- gets engaged to someone else! This is a prequel - of a 15 book series- and I loved writing an origin story of how she gets her dog and how her very different parents met. There were so many questions readers have had over the years that it was joy to write & give some answers. Yes Cara--how dressy? Floaty linen or tight little Herve Leger? And inside or outside ? Heels on grass.. Ugh. And yes tell us about the book! The cover says prequel! And yes the great thing about going to Italy is what fun to BUY whatever you forgot ...Karen sound like you really worked it! Wow, that is a loooong tour! Bonne chance! I agree with the all-black wardrobe (I throw in navy just to be daring...) leopard flats and some scarves brighten it up. Worked for me in Paris, where I spotted the Leduc sign near the Louvre! Spotting it made me ridiculously happy. That is such a shame you were sick and we missed meeting in Paris, Susan! Next time I'll take you to a new discovery, a tiny French stand up tapas bar near the Seine. Leopard flats 👠And heels too? Cara! Je suis desolee que tu aren't speaking in Boston! Rolling up clothes a la cigarettes? I'll try it. My travel wardrobe is like yours only I wait for Eileen Fisher to go on deep sale and buy a piece at a time. Even bought years apart they go together. I suppose that's the good news and the bad. Hmm, dressing for the wedding. Slouchy silk trousers and a silk tank with a colorful gauzy scarf/shawl. Hallie, wish we had an Eileen Fischer outlet here but Libby Hellmann took me to one near Chicago! Love your slouchy & silk Conor idea! Cara, you are so right re black for travel. It is always appropriate and doesn't show the red wine stains! I am a great packer, can easily get everything I will need in a roller bag plus my Healthy Back Bag for my Kindle, phone, meds, and everything else that goes in a purse. Obviously I don't go on book tours, and we try to stay in no more that 1-2 places. In Paris we rent the same apartment every time, and, wonder of wonders, there is a laverie just around the corner. So no need there to fuss with nightly washing out stuff. Since I am not writing the great American novel, my Kindle Fire is my travel computer, small, light and fits my needs. Although last time I only used my iPhone. Gone are the days for carrying a laptop for this old dame. I always use a packing envelope for clothes. Things http://www.travelsmith.com/large-travelsmith-smart-envelope/583911lie flat, don't wrinkle, and are compressed into the smallest possible space. (It works for jackets) http://www.travelsmith.com/large-travelsmith-smart-envelope/583911 This is indispensable in my opinion. Trust me. I am a nurse. Carry on. Sorry about burying that link in the middle of a sentence. Ooh thank you Ann and having a Laverie around the corner is gold! What's a packing envelope, Ann? So happy to see Cara here. I have to admit this is one series I have been wanting to get to forever and now I finally will. When SOHO Press offered that adorable shoe tote bag for pre-orders, I snagged a copy of the book and the tote bag. And since the book is a prequel to the series, it seems the perfect way to jump into this series that I know folks love. Exactly Kristopher! I cannot wait to read it! And free stuff? Make sure you click that link I have on the main page today! Why not mail/FedEx your wedding outfit to the place you'll be staying for the event? That allows you to have special shoes, even a hat! That's a totally brilliant idea Connie - on it! Aha! And Connie, that is how I got my big dress to Malice! And I shipped it home too! Worked perfectly! Hank You must be on first name basis with your Fed Ex guy/gal? Cara, I was traveling solo from NYC to PAris to London and carrying my own bags -- I had one pair of black boots (which KILLED my feet -- never wear boots on a flight), leopard flats and leopard vans. No heels. I was keeping track of my distances and I was walking 5 to 8 miles per day! Also, all I think about is how to get back to Paris. Do you think my family would believe me if I said I needed to do more research? Cara, when are you back??? Susan, don't we always need to do more research in Paris 🤓? Will be back in November so come over. But it's a good plan! Just insure like mad. And Cara--did you Reread the whole series first? When I go somewhere for the weekend, I've become pretty good at putting everything in a backpack. Including toiletries. My husband is the real packing genius. Must be all those years in the Army. Thank goodness he's going to New Orleans with me so he'll be able to fit us both in one suitcase! Cara: I'm looking forward to your Portland stop on the 22nd. If you need a ride, you know how to get in touch with me. I'd be honored to be your squire once again. I learned the rolling technique from a well-traveled woman when I first went to Europe; now I use the little square inserts to sort various things but I still roll everything up. Up next, however: a roller; I see people running through Heathrow while I lug my two-wheeler at an angle, and that gets harder with each passing year. Like your wedding I learned that you can't mix too many types of travel at once: Tea at Browns followed by hiking in Cornwall. You should never plan a trip that requires both hiking boots and sticks AND a sport coat, tie, slacks and dress shoes. I've tried different packing ideas for different trips over the years. Packing envelopes certainly work; my husband started using them for his business trips. I've done the roll up your clothes like hotdogs approach too. That one works better for carryon bags. With his status or credit card or club membership or some magical thing my husband can check our bags for free. So my carryon gets checked rather than hoisted into the overhead. I bought our granddaughter a royal blue carryon bag for Christmas a few years ago. She has learned well! She actually carries it onboard with her and depends on the kindness of strangers to put it in the overhead for her. One of my favorite tips for traveling is to use a Violife Slimsonic toothbrush. It is small, battery operated, no charging required. I got my first one online, but you can get them at Bed Bath & Beyond. They're about $15. Lightweight and take up no room at all. As for the wedding, find something you really like and send it to your editor to hold for you. Now I need to find this prequel to read! Cara, so excited for the prequel!!! Love the packing tips, too. Can I ask, what brand leggings do you get that dry overnight? I need a uniform, and washables, and somehow never manage to carry it off. I do roll my clothes, and I would never go back to a suitcase without spinners. You are le chic, always!! Yes, a family tree--what a good idea! And it is impossible to hold all the characters in your head..but what a lovely problem! Christopher, you made me laugh out loud. You are So right! That is a very high degree of difficulty packing. But yes, Cara, how do you stay..unfrazzled on book tour? Yes, what is this "hiking" you talk about? Yes, resting, really resting, seems to be the key. I watch Project Runway and Say Yes to the Dress, I admit..
Back again. My well-traveled daughter suggested the spinner bags, too, but because you can see them better in front or to your side than dragging along behind. In the last couple of weeks, in four countries, I've seen hundreds of people rolling their bags with ease in this way. Hank, you're brilliant! Shipping was such a great idea. Cara, have you seen or used Oscillcoccinum ? It's saved me many times, including on a trip or two, if a cold or flu threatens. Hey Cara! I'll see you and Mr. Christopher at your reading! Glad you're coming through Portland. And, I agree: black with accents. I'm a clothes roller too. Noted, Karen and thanks! Yay Lisa! I have the pull-behind type carryon bag because my husband claims the spinner types are harder to fit into the overhead space. Anyone have any opinions or experience with this issue? Thanks. OK, this is probably cheating, but you could do Rent the Runway for the wedding. Can't wait to read the prequel! Cara, your packing is inspirational and mirrors how my daughter packs. She even has the wash and wear undies that are quick drying, so she takes only two or maybe three pair for trips. She also rolls her clothes and has tried to convince me that it's the way to go, but I'm a tissue person like Hank. Using the tissue is more of a pain, but it works for me, so I'm still folding with the tissue. And, I am so excited about your prequel, Murder on the Quai. Your series has loomed large in my TBR series list for some time, and I've decided that I can start with this book to kick start my reading the series. I thought I had pre-ordered it, but I just checked on Amazon, and it's not there, so I need to be sure that I didn't order it somewhere else. But, I will be ordering it before next week's publication day. Kathy--and all!--here's the link for the special tote offer! Wait, I'm still trying to get over packing linen. That's impressive! Seriously, if I ever have to go on a longer than one week tour, I'm flying Diane Vallere in. She is a genius at packing, coordinating, everything. As for me, three colors, two pairs of shoes and a cosmetic bag. Done. Sorry to chime in again so late, Cara. Rent the Runway is like tux rental, but dresses. Your selection is delivered and you can send it back by mail.